Itihasa made itihasya...: Experiencing the ancient Pallavas....today! Those familiar with my blog would notice couple of people who figure often in my accounts. People, who I think add lot of value to history and historical thinking. And to my mind there are not many in India who seek to do much to popularize history particularly among kids. In my humble opinion, while academic researches are fine and very much needed but ultimately the popularity and relevance of history depends largely on people who not only research but are eager to share those researches and understanding with the hoi polloi. One such scholar is is S Suresh, historian and art history expert with whom my acquaintance goes some 20 years but acquaintance which was sporadic. In 2006 with Suresh's guidance I had organised a study tour of the Cholas. This year (actually December 2007) it was a tour of the Pallavas again under his guidance. The thing about Suresh is the way he is able to simplify matters and put it in a format that children relate to well and enjoy. This time around his explanation of the Vaikunta Perumal temple in Kanchipuram was a revelation. 'Common sense' has it that Indians understanding of past is all enmeshed with myths and puranas and our understanding of time is not linear. In other words Indians lack a sense of history - a truism, now part of the worlds' "common sense". 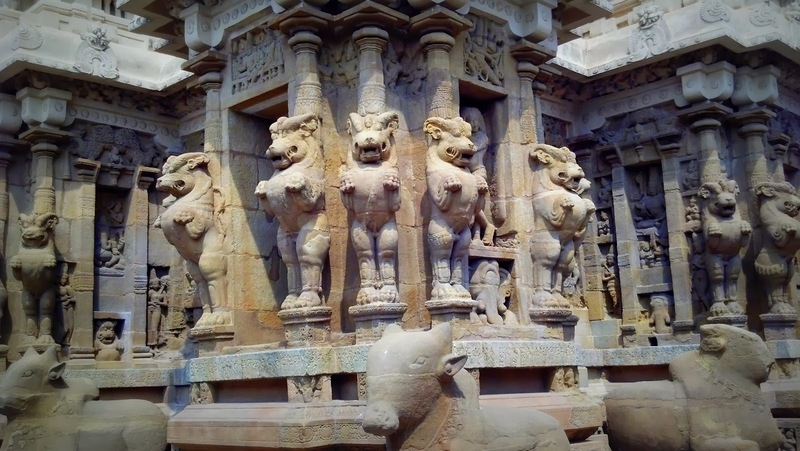 But Suresh through his study of the sculptural panel that runs around the Prakara of the Vaikunta Perumal temple built by Nandivarman II Pallava, established the unfolding of Pallava history in linear and 'secular' mode! And though in these panels there are references to myths and religious sanction is clearly sought, the panels talk of 18 coronations, important events in Pallava history, which includes even unflattering portrayals. For example there is this panel which depicts the rather brutal victimization of the Jains by the Pallavas. And then there are two panels left hollow to indicate turmoil, confusion in Pallava history that are best forgotten! Such a version of history put across in a sculptural narrative effectively puts a lid to the claim that Indians did not possess the mindset to look at time in more temporal terms. This panel shows a Jain being held upside down and on the verge of being slaughtered...days of Hindu revivalism?? Kids were asked to identify the panel of the coronation of 18 Pallava kings which naturally enough appears 18 times along the prakara. Then Suresh often narrated a particular event and asked the kids which of the panels best described them. We also covered the Kailasnatha temple and Ekambarshwara temple at Kanchipuram, architecturally and sculpturally both more accomplished than Vaikunt Perumal but after the seeing the panels at the latter, the refined sculptures at Kailasnatha and the huge Vimana and the fascinating pillars of Ekambarshwara, did not seem to make as great an impression on me in terms of historiographic significance. Of course a study tour of the Pallavas without a visit to Mahaballipuram, is not complete. But heavy rains prevented us from going to the shore temple but did manage the Varaha cave and Arjunas penance. So here it was again - a field visit where kids get to see, feel and experience the past as it were. How much the kids understood of the historical significance of the Vaikunt Perumal temple, I'm not too sure. (a look at the report will give one a better idea...) It was fortuitous for us to have S Suresh guiding us, helping us all to gain first hand, an appreciation of south Indian heritage and history. I ensured that once students got back to the lodge they put their heads together and wrote a project report. I'm also enclosing what children had to offer as their understanding of Pallava history here. Please note some of the larger concerns which I highlighted in my earlier entry on the Chola tour, remained even here. In fact I continued with my study of temples even this term where along with tremendous support and inputs from my colleague Rajesh Chandran, the children sought to highlight the temples political and social significance through theatre and multimedia. More about it later.